Burgundy is back, baby! And that makes me one happy camper because it’s one of my favorite colors. Now, I’d like to suggest a color pairing that not a lot people think about when it comes to their fall burgundy outfit planning…turquoise! The tealy-blue is such a nice pop against the dark moody red. Here, I opted for a bright bold ring, but imagine a turquoise scarf, dangly earrings, brooch, or chunky necklace instead. It’s good, right? Seriously, try it! a Fit Review with measurements of this burgundy blazer can be found here. this leather envelope clutch has just been restocked in black, and it’s on sale. I’ve found it to be the perfect size, deliciously smooshy, and because it’s so soft, it can unexpectedly hold a lot. 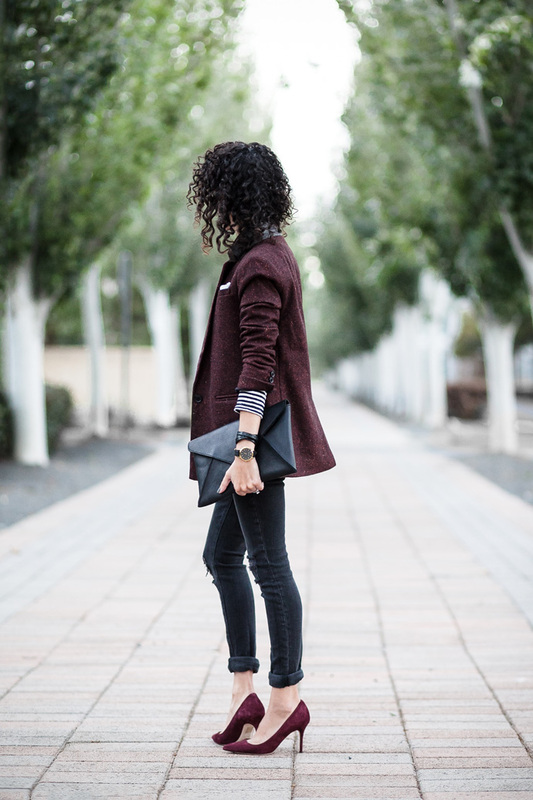 That burgundy is stunning! Love this business casual look on you. Great style girlie. Agree that turquoise is a great color to match with burgundy! I have never thought of it until now, thanks for the inspiration! Really love that jacket with the burgundy shoes — had to leave a comment! Your posts have been awesome lately!